Sturgeon Bay residents favor Public Market concept over latest Hotel proposal | Vandewalle & Associates, Inc.
STURGEON BAY, WI: At a Public Meeting held by the Sturgeon Bay West Waterfront Planning Commission, residents and other stakeholders were able to express their views on the merits of the most recent development proposal to come up for consideration. 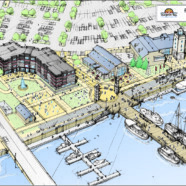 The redevelopment plan for Sturgeon Bay’s underutilized West Waterfront originally included a two-story Four-Seasons Public Market, which many residents still hope will still happen there. However, the latest proposal for this City-owned parcel is for a five-story 90-room hotel and comes from Sturgeon Bay resident Robert Papke. Some residents voiced concerns over building a hotel on the site. Vandewalle & Associates has been helping not only with development of the West Waterfront Redevelopment Plan, but also with developer recruitment throughout the planning process. The Plan has been adjusted repeatedly over the last months based on the most viable of the developer and market opportunities on the table. Read more about the meeting in the Door County Daily News.